Here is the announcement placed in the 'Reading Mercury' of November 16th 1895; it appears below the maps. The Deposited plan of the proposed route can be seen at Berkshire Record Office, showing sectional drawings of the entire route, and a detailed list of land-holdings and their owners by Parish. Sections of Ordnance Survey Map from Deposited plan, reproduced by permission of the Berkshire Record Office, ref. 'Q/RUm 208'. Swallowfield Park, country seat of Sir George Russell M.P., chairman of the South Eastern Railway, can be seen to the west. Further east, Barkham Square , home of Edward Sturges, chairman of Wokingham Rural District Council, is very close to the proposed line. Notice also that the main settlement in Winnersh was then named 'King Street', and that at that time there was no station at Winnersh. On Nine Mile Ride, the Bearwood estate had a sawmill and brickworks on what is now Kiln Ride; these were connected with the Reading-Guildford railway by a standard-gauge horse-drawn tramway, clearly shown on 19th-Century large-scale Ordnance Survey maps available to view at Wokingham Local Studies Library. Finally, a brickworks was established on Molly Millar's Lane, also connected by rail with the Reading-Guildford railway, as marked on 20th-Century one-inch O.S. maps and larger-scale maps of the area. 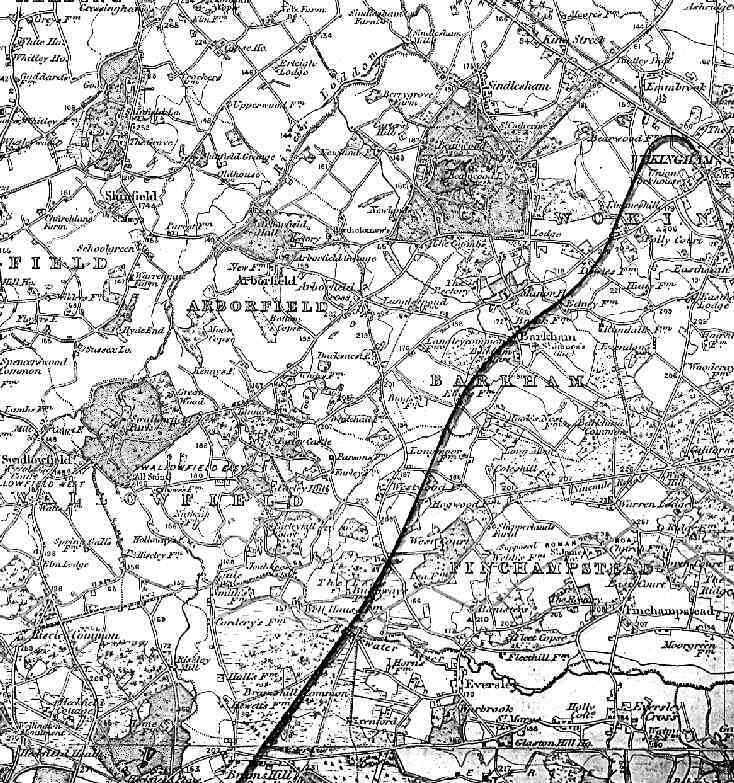 A railway commencing in the parish of Basing in the county of Hants, by a junction with the main line of the London and South Western Railway at a point 19 chains or thereabouts east of the bridge carrying the main road from Basingstoke to Reading over that railway and terminating in the parish of Wokingham in the county of Berks, by a junction with the Reading and Reigate branch of the South Eastern Railway , at a point 13 chains or thereabouts south of the bridge, carrying the main road from Wokingham to Reading over that railway. Which said intended railway will be made or pass in or through the parishes and places following, or some of them, that is to say: - Basing, Monk Sherborne, Sherfield-on-Loddon, Hartley Wespall, Heckfield, Mattingley, Bramshill, and Eversley, in the county of Hants, and Finchampstead, Barkham, and Wokingham in the county of Berks. To vest in the Company the usual powers granted to railway companies for the construction and maintenance of railways and works, and especially the powers granted by the 16th section of the Railways Clauses Consolidation Act, 1843, and to enable the Company to cross, alter, stop up, or divert, whether temporarily or permanently, roads, footpaths, towing paths, railways, tramways, rivers, navigations, streams, sewers, and other works, and to alter or remove any telephonic, electric, or telegraphic wires, posts, tubes, or apparatus, gas, and water pipes as may be necessary or convenient in constructing or maintaining the said intended railways and works, and to divert or stop up and appropriate the soil of any streets or public roads and footpaths within the limits of deviation marked on the deposited plans, and to extinguish all rights of way over the same, and to authorise deviations laterally and vertically from the lines and levels of the works as shown upon the plans and sections hereinafter mentioned to any extent which may be defined in the intended Act. To enable the Company to demand, take, and recover tolls, rates, and charges upon or in respect of the intended railway and works, and of any railways which may be run over and used under any powers to be conferred by the intended Act. To authorise the Company to purchase and take by occupation and by agreement lands, houses, tenements, and hereditaments, and to empower the Company, not withstanding Section 52 of the Lands Clauses Consolidation Act, 1845, to purchase and take by compulsion a part or parts of any house, building, manufactory, or premises without being required, or compelled to purchase the whole thereof, and to vary or extinguish all rights and privileges in any manner connected with the lands, houses, tenements, and hereditaments so purchased or taken. To authorise the purchase and taking of a piece of land in the parishes of Sherfield-on-Loddon and Hartley Wespall, known as Hartley Mill Meadow which is reputed to be lammas or commonable land, of which six and a half acres or thereabouts will be within the limits of deviation, and of which it is estimated that not more than one acre will be actually required to be taken. To empower the Company on the one hand, and the London and South Western Railway Company, or the South Eastern Railway Company on the other hand, to enter into and carry into effect agreements with respect to the construction, working, use, management and maintenance of the said intended railway and works, or any part or parts thereof, the supply of rolling stock and machinery, and of officers and servants for the conduct of traffic on the said railway, and to the costs, charges, and expenses of such construction, working, use, management, and maintenance, and to the regulation, management, and transmission of the traffic of the railways of the contracting companies and the collection, payment, division, apportionment, appropriation and distribution of the tolls, rates, and charges arising from any such traffic. To authorise and empower the London and South Western Railway and South Eastern Railway Companies to subscribe for and hold shares in the capital of the Company. 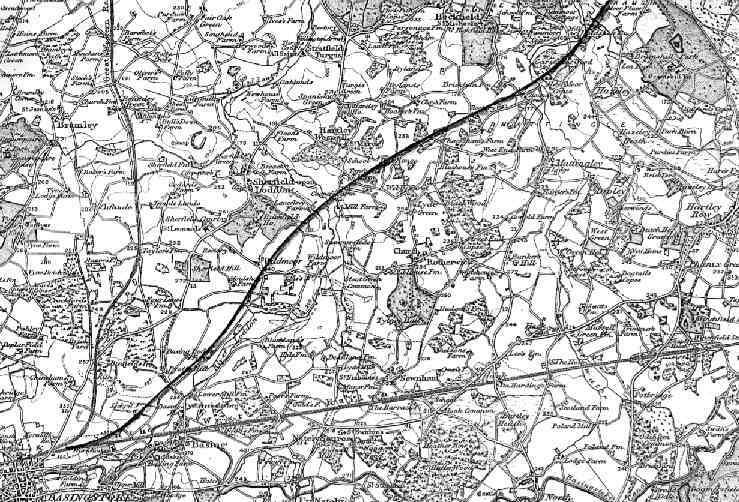 So much of the main line of the London and South Western Railway as lies between the commencement of the proposed railway and the Basingstoke Station of the London and South Western Railway, including that station. So much of the Reading and Reigate Branch of the South Eastern Railway as lies between the Junction therewith of the Staines, Wokingham and Reading Branch of the London and South Western Railway and Reading. Together with the Reading Station of the South Eastern Railway, and all other stations on the said portions of railways, and all roads, platforms, points, signals, water, watering-places, engine sheds, standing room for engines, carriages, and wagons, booking and other offices, warehouses, sidings, loading and unloading places, turntables, junctions, machinery works, and conveniences of or connected with the said railways and stations. To enable the Company to fix, demand, take, and recover tolls, rates, and charges upon or in respect of the portions of railways stations and works to be run over and used as herein-before-mentioned, and to confer, vary, or extinguish exemptions from tolls, rates, and charges. To enable the Company, notwithstanding anything in the Companies Clauses Consolidation Act, 1845, contained to the contrary, to pay out of the capital or any funds of the Company from time to time interest on dividends on any shares or stocks of the Company. The Bill will vary and extinguish all existing rights and privileges which would interfere with any of its objects, and confer other rights and privileges, and it will incorporate with or without exemptions and modifications the Lands Clauses Acts; the Companies Clauses Consolidation Act, 1845; and the Companies Clauses Acts, 1863 and 1869; the Railways Clauses Consolidation Act, 1845; and the Railways Clauses Act, 1863, and it may amend or alter so far as required for any of the purposes of the intended Act, the 4 and 5 William IV., cap. 88, and any other Act or Acts relating to the London and South Western Railway Company and the 6 William IV, cap. 73, and any other Act or Acts relating to the South Eastern Railway Company. On or before the 30th November instant, plans and sections of the intended railway and works, and plans of the lands which may be taken compulsorily under the powers of the intended Act, with a book of reference to such plans, containing the names of the owners or reputed owners, leases or reputed leases, and occupiers of the said lands, and also an ordnance map with the lines of the said intended railway delineated thereon; and a copy of this Notice, as published in the London Gazette, will be deposited for public inspection with the Clerk of the Peace for the county of Hants, at his office, at Winchester; and with the Clerk of the Peace for the county of Berks, at his office, at Reading; and on or before the same day a copy of so mush of the said plans, sections, and book of references as relates to each parish or extra-parochial place in or through which the said intended railway is to be made, with a copy of this Notice as published in the London Gazette, will be deposited for public inspection in the case of each such parish with the parish clerk thereof, at his residence, and in the case of any extra-parochial place, with the parish clerk of some parish immediately adjoining thereto, at his residence, and as regards any rural parish for which a parish council has been elected, also with the clerk (if any) of the parish council of every such parish, and if in any such parish there be no clerk of such council, then with the chairman of that council at his residence. And Notice is hereby given that on or before the 21st day of December next, printed copies of the promised Bill will be deposited in the Private Bill Office of the House of Commons. F. C. MATHEWS, BROWNE, & CO., 151 Cannon-street, E.C., Solicitors. DYSON & CO., 24, Parliament-street, Westminster, S.W., Parliamentary Agents.